Recently, on Friday, December 18, 2009, Judge Thomas F. Burke, Jr., trial court judge in the Luzerne County Court of Common Pleas, entered a directed verdict in favor of the hospital defendants in the case of Williamson v. Robert Yamulla, M.D., Eugene Stish, M.D., Greater Hazleton Health Alliance d/b/a Hazleton General Hospital, and Hazleton General Hospital, No. 3896-CV-2004 (Luz. Co. Dec. 18,2009). 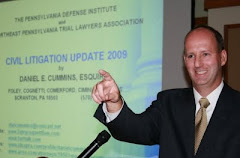 According to the transcript of the trial proceedings on this aspect of the case, Judge Burke, who is now the President Judge of Luzerne County, ruled that the plaintiff failed to meet the requirements of the ostensible agency doctrine by failing tie the individual doctor defendants to the hospital defendants in order that liability would attach to the hospital defendants. Judge Burke found that the testimony established that the plaintiff had extensive prior individualized treatment with the doctor defendants unrelated to the hospital defendants. The Judge also noted that there was "no indication whatsoever" that the hospital defendants had held out the doctors as being agents of the hospital with regards to the treatment in question. Accordingly, the Judge ruled that, no reasonable person could be justified in believing that the care in question was provided by the hospital or its agents. As such, the hospital defendants were dismissed from this matter by way of a directed verdict at the close of the Defendants' case at trial. Thanks to Attorney Tim Holland, counsel for the hospital defendants, for bringing this case to my attention. Attorney Holland may be contacted at his Wilkes-Barre, PA law firm of Holland, Brady & Grabowski for any additional information on this case.